AMAZING! Australian Magpie and Jack Russell terrier are best friends. NEWS ITEM: Cuban dissident Jorge Luis García “Antúnez” and his wife come to Miami for medical care. Garcia pays the U.S. back for its hospitality by calling President Obama a "leftist." García, who spent 17 of his 49 years in prison, and his wife, Yris Tamara Perez Aguilera will return Tuesday to their hometown of Placetas in central Cuba. They are considered to be among the most active government critics on the island. Both received medical treatment while in the United States, he said. But Garcia didn't stop there. Local 10's Bob Norman also got Garcia on tape taking a shot at Obamacare: "If it comes from Obama, then it can't be a good plan," Antunez said. Have a nice trip back to Cuba, a**hole. 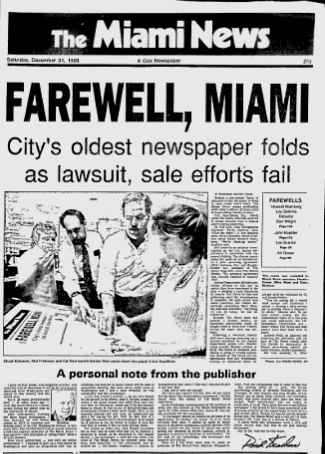 Dec. 31, 1988: 92-year-old Miami News ceases publication. Don Wright's final Miami News cartoon. Criminal Enterprise: The FBI defines a criminal enterprise as a group of individuals with an identified hierarchy, or comparable structure, engaged in significant criminal activity. Organized Crime: The FBI defines organized crime as any group having some manner of a formalized structure and whose primary objective is to obtain money through illegal activities. 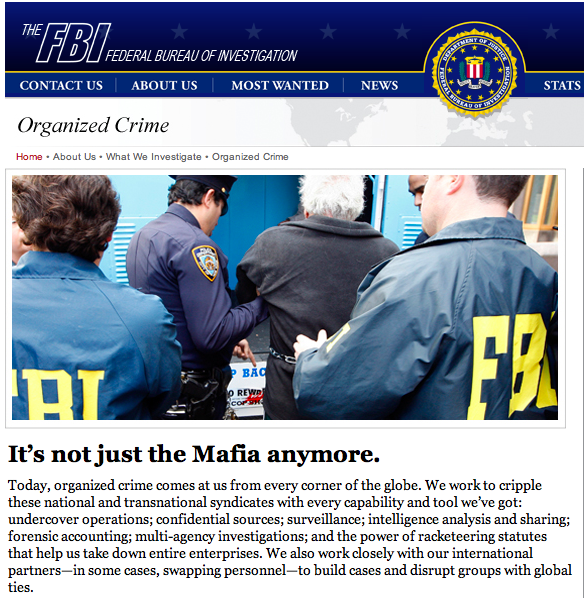 The headline on the Organized Crime page of FBI's website pretty much says it all: "It's not just the Mafia anymore." Feds to Bal Harbour: Hand over $4 million in seized drug loot. How Sunrise Police make millions selling drugs. SUNRISE — Police in this suburban town best known for its sprawling outlet mall have hit upon a surefire way to make millions. They sell cocaine. Undercover detectives and their army of informants lure big-money drug buyers into the city from across the United States, and from as far north as Canada and as far south as Peru. They negotiate the sale of kilos of cocaine in popular family restaurants, then bust the buyers and seize their cash and cars. As those stories show, in South Florida it's becoming increasingly difficult to differentiate between the cops, the Corleones and the Sopranos. Sweetwater police officers knew what was expected of them when they patrolled the streets of this small city in west Miami-Dade. They were to arrest the highest number possible of suspects in order to tow their vehicles, even if the towing had no connection to the alleged crime. Sweetwater depended on the $500 administrative fine it collected from people recovering their vehicles. In fact, the city had set a yearly goal of $168,000 of these fines under the category of “miscellaneous revenue” in its police budget. And the company, Southland The Towing Company, was partly owned by former Mayor Manuel “Manny” Maroño for quite awhile — although many officers apparently had no knowledge of that. Arresting, then towing became the norm in Sweetwater, according to several officers who spoke on the condition of anonymity. Figures show 37 percent of all arrests in Sweetwater last year resulted in towing. • Two-thirds of the arrests were for traffic violations, including driving with a suspended license or without a license. In cases of criminal charges, 77 percent ended up dismissed by the state attorney’s office or a judge. Some 11 percent led to criminal convictions. • One in four arrests with towing took place at the Dolphin Mall, a shopping center annexed into Sweetwater in 2010. That same year, Southland obtained the monopoly to operate in the city. Although the majority of the Dolphin Mall arrests occurred in the parking lot, the arresting officers did not allow subjects to leave their vehicles there. Even in the cases of shoplifting inside the stores, officers apparently went outside to the parking lot to search for the subjects’ vehicles to tow. • The suspects usually had limited incomes and could not afford the $500 fine the city charged, in addition to the storage fee they had to pay Southland to get their vehicle back. Nearly one-third of the arrests were unemployed people, while 35 percent said they were workers or students. Many drove popular cars, like Nissan Altimas and Honda Civics, which were a majority of the cars towed by Southland. • In 40 percent of the cases — most of which were for driving without a license or for possession of marijuana — officers released the suspects with a "promise to appear in court." Typically, charges were dropped before a public defender was assigned to the case. But Mafia-like behavior by South Florida law enforcement isn't limited to just Sunrise, Bal Harbour and Sweetwater. Earlier this year, a federal judge ripped the Miami Police Department for its "culture of corruption." “It seems the City of Miami Police Department has a culture of corruption that exceeds all other police departments," U.S. District Judge Robert Scola remarked after sentencing a Miami cop to 15 months in prison for extortion. And the corruption isn't just limited to law enforcement agencies. As I reported here last May, Miami Beach elected officials, bureaucrats and shady businessmen, have for years, enabled two Miami Beach towing companies to extort hundreds of thousands of dollars annually from Miami Beach residents and tourists. Miami Herald, Nov. 22, 2013: Tainted by scandal, Sweetwater Police Department is in turmoil. 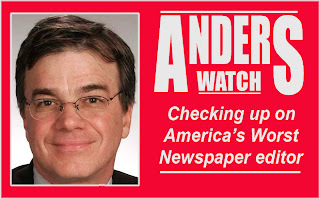 Read related Miami Herald stories on Sweetwater corruption by clicking here. In Istanbul, when you order an ice cream cone, you also get a show. 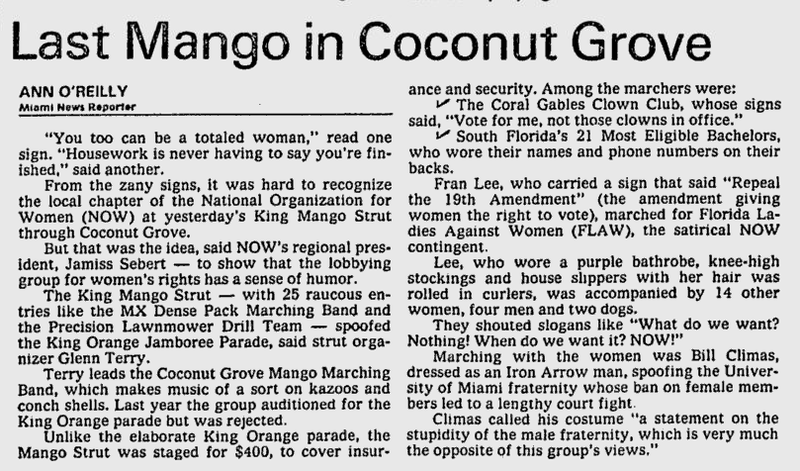 The first King Mango Strut was held on Dec. 26, 1982, and was staged for $400. Miami News, Dec. 27, 1982. From the Miami News, March 1, 1973. Maymo, a lemon beagle, gets the best Christmas present, ever...210 water bottles. Here's something to consider the next time you tune in to WLRN and they're asking you to pledge your hard-earned money to "keep the station on the air." Miami-Dade County Public Schools and WLRN are both making serious cuts to part-time employee hours, supposedly because of Obamacare. The cutback will affect "several hundred" school employees, including substitute teachers, custodians, and security guards, according to an MDCPS spokesman. Also seeing their hours slashed are part-time WLRN employees, some of whom are paid by the school district. Under Obamacare (officially called the Affordable Care Act, or ACA), large employers must provide health insurance to employees who work 30 hours or more. Put another way, WLRN and the Miami-Dade County School Board have cut the hours and pay of employees who can least afford it. And just in time for Christmas. Employees interviewed by New Times "say their hours are being cut from 30 to 25 per week." A WLRN staffer told New Times, "No one seems to have seriously considered the alternative: that the school district pony up and pay for health insurance for all employees working at least 30 hours. "I'm sure it would be expensive to cover us," she says. "On the other hand, Starbucks continues to offer its employees health insurance. What's wrong with this picture? What's wrong with this country? Why is nobody talking about this? "This is a lot of money and a lot of people we're talking about. It looks like they are going to make money on our suffering." But not everyone at WLRN is suffering. 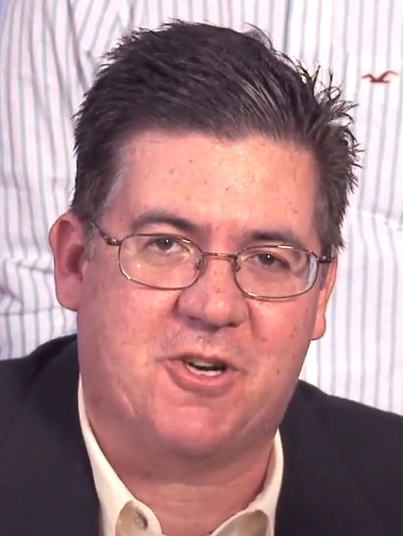 WLRN's general manager John Labonia is doing just fine, thank you very much. Labonia has been with WLRN since 2000, and according to one staffer, his tenure has been one of "bullying, harassment and downright evil behavior." Labonia, at times, runs the station like some 1860s Mississippi plantation owner, thinking up subtle ways to demean and belittle station staffers, and "keep them in their place." Beginning July, 1st all radio personnel will be required to perform routine dusting and light cleaning during their shifts. Bernie is going to speak with Alfred about getting some Swifter dusters and some other light cleaning materials. Meanwhile, one station staffer told New Times that she makes so little "that she hasn't been to a sit-down restaurant in two years." Like I said, he's doing just fine. 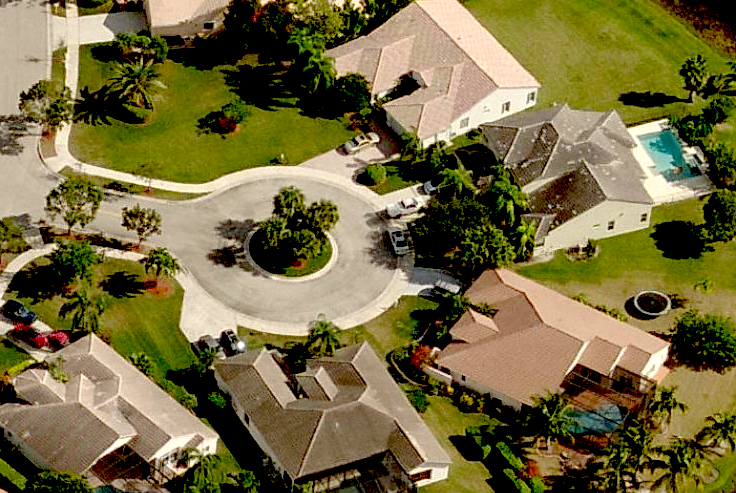 While his staffers struggle to provide for their families this Christmas, Labonia pulls down a hefty salary - paid for, in part, by Miami-Dade County taxpayers - and lives in a half-million dollar home that sits on a pleasant cul-de-sac in Weston. very nice house in Weston. Before I leave for my holiday/furlough period, I want to thank you all for all that you do. I know my thanks will not help to ease the hardships caused by altered work schedules and other difficult conditions here, but I do want to offer them just the same. You guys are the core, the heart of this enterprise. WLRN Radio would cease to exist without you. So thank you for always being there, always doing what’s asked of you and then some, day after day, week after week. You’ve made us what we are and will help to make us what we hope to be. I hope your holidays are peaceful and fulfilling. Argentine commercial for Coca-Cola captures reality of early parenthood. They played another game of musical chairs at the Miami Herald today. 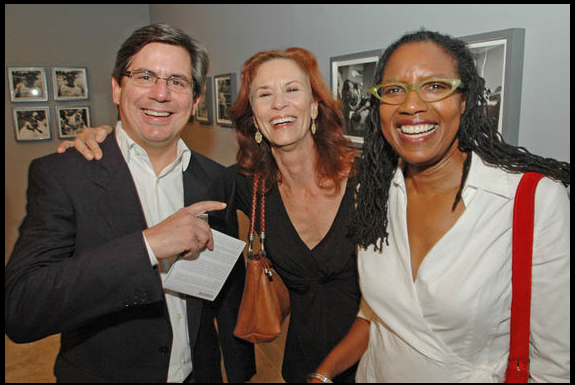 Nancy Ancrum, a journalist with more than 30 years of experience who for the past two decades has weighed in on editorials ranging from local government to healthcare, has been named editorial page editor for the Miami Herald. In recent years, as the news industry has evolved, Ancrum has worked to enhance the editorial board's community outreach and online presence. But now that she's in charge, perhaps Ancrum will actually "enhance" the editorial board's "online presence" by being more active on Twitter. Right now, it doesn't appear that she understands how to use it effectively. Maybe that's why she has just 32 followers. And, here's what else today's story about Ancrum's appointment didn't say: Her promotion surprised no one at the paper. The Herald hasn't hired any new staffers in years. When someone at the paper leaves, they look for someone within the building to replace the departing staffer....kind of like a never ending game of Whack-a-mole. So, when the former editorial page editor Myriam Marquez, was named executive editor of el Nuevo Herald last October following the departure of Manny Garcia, Ancrum - who had been the editorial page letters editor - was really the only choice to succeed her. So that's five four people responsible for producing two pages of the paper that almost no one in Miami-Dade County pays attention to anymore...unless they print something really stupid, like they did recently. Here are a few more things you won't read in the Herald. The Herald has yet to replace longtime obituary writer Elinor Brecher who retired in September. Add to that, a half-dozen or so copy editors who've left since the first of the year. And the paper now has three fewer photographers than it did a year ago. Forty-year veteran photographer Tim Chapman retired in December 2012, and photographers Marice Cohn-Band and Joe Rimkus Jr. recently accepted a buyout and left the paper last week. When those three walked out the door, they took with them a combined 115 years of experience. And they're not being replaced. And despite a skyrocketing crime rate in Miami-Dade, the paper hasn't had a full-time police reporter in years. However, Herald honchos continue to insist that they're producing a quality newspaper. But, if that's the case, how do they explain the fact that they're practically giving away what they produce? 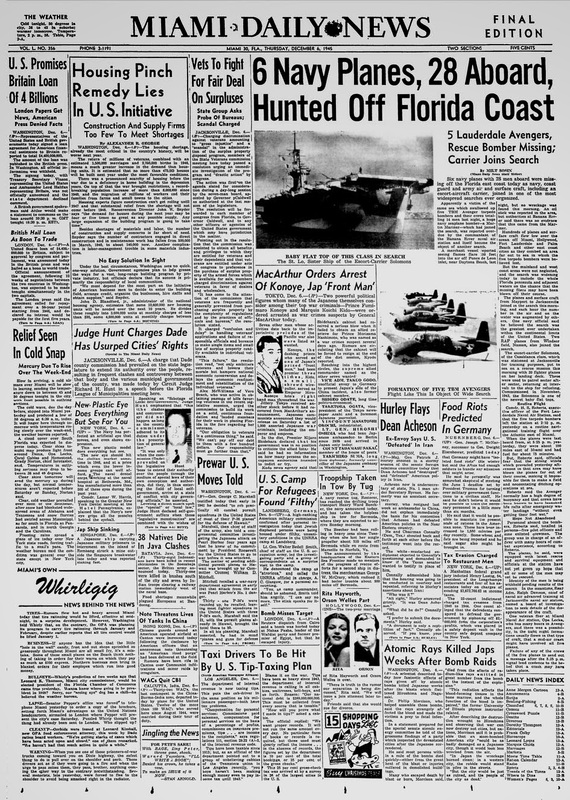 Miami News, Dec. 12, 1972. 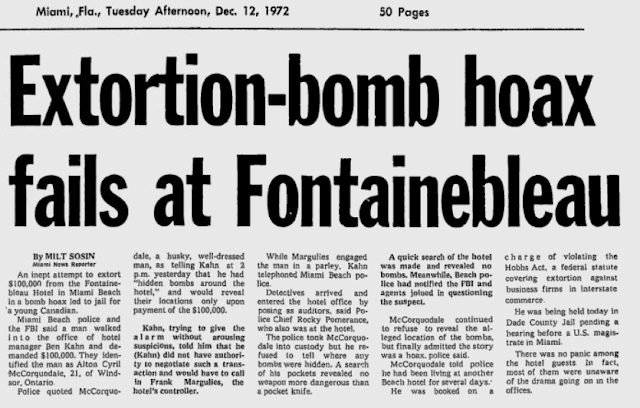 41 years ago this week: 21 year-old Canadian Alton Cyril McCorquodale sauntered into the manager's office at the Fontainebleau and announced that he'd "hidden bombs around the hotel," and would reveal their locations if he was paid $100,000. He didn't get the money. Jon Stewart: "Obama had the audacity to greet another world leader with a gesture so meaningless you can train a basset hound to do it." 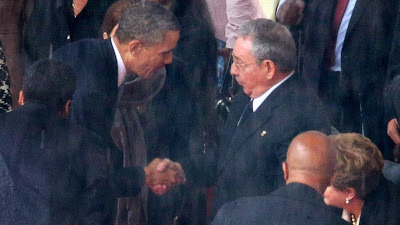 President Obama shook hands today with Cuban President Raul Castro at the memorial service in South Africa for the late Nelson Mandela. Reaction was swift and predictable. 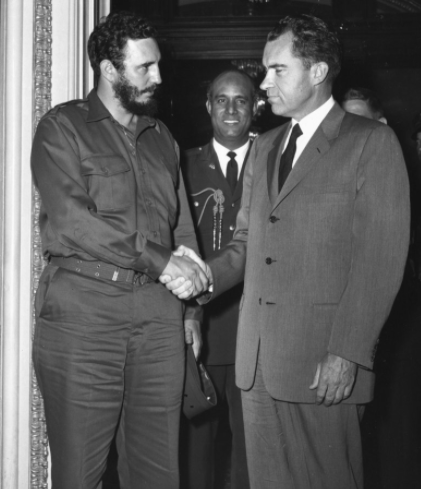 Minutes after the photo of the handshake was flashed worldwide, Univision anchor Jorge Ramos tweeted this: "Question: Has there been a U.S. President who has greeted Fidel or Raul Castro since l959?" There answer is yes. Clinton shook hands with Fidel at the United Nations in 2000. One Miami TV station sent a reporter to the Versailles, where he went to work rounding up the usual suspects. And Cuban-American lawmakers in Washington reacted swiftly, too. Ileana Ros-Lehtinen said this of the handshake: "Blah-blah-blah-blah-blah-blah-blah." And, over at el Nuevo Herald's website, the story of The Handshake of the Century has generated over 170 comments...most of them in this vein: "There are those who voted for Barack Obama. Now, the golden boy gives them a kick in the face and greets the tyrant with a brazen smile. Congratulations!" 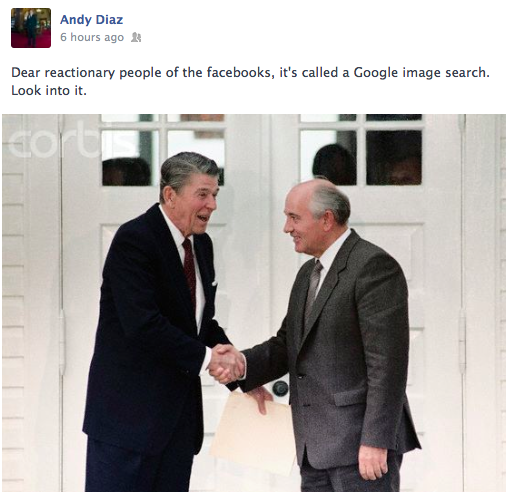 After Diaz - a Cuban-born, Miami-raised, management consultant living in Washington DC - posted that, a lively discussion ensued. I have friends and relatives who suffered under the Castro regime. I also count myself in that group since I was born and raised in Cuba, and felt and saw the oppression every single day of my life. So let's ease off on the sanctimony, shall we? The president of the United States doesn't play juvenile games with dictators, and pretend not to see them, or ignore them on purpose. That is childish. By the way, Obama himself is the perfect argument against the Castros' persistent argument that black men have no future in the United States. As it turns out, their future is far brighter than it is in Cuba, where the same cadre of white dudes has ruled for almost 60 years. And also, if today was a victory for the Castros, how come the images haven't been shown on Cuban TV? I wrote a short profile on Sharpstein in 2010 which I've reposted below. Richard Sharpstein, a former Assistant Dade State Attorney, has been practicing law in Miami for more than 30 years. His firm's website says that "he has tried hundreds of cases across the spectrum of criminal defense, civil fraud and civil rights litigation in high profile and complex cases representing corporate executives, politicians, international bankers, police officers, and other public figures." And reporters covering Sharpstein's cases know they can count on him for highly printable quotes and sound bites. 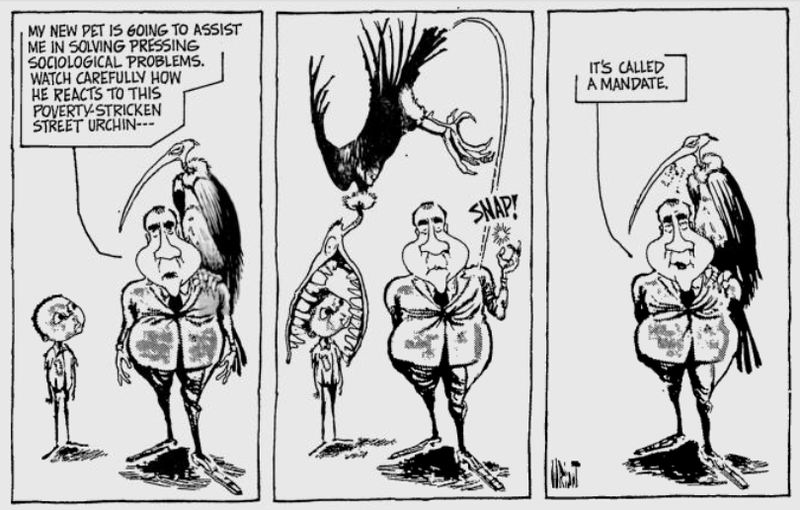 In 1990 when he was representing a client involved in the case of former Panamanian strongman, Manuel Noriega, the Miami Herald said this of Sharpstein, "a big fan of metaphors and twisted cliches, he approached Noriega at his bond hearing and, after a few jokes, asked him for help in answering a few questions about the case. Noriega agreed. Sharpstein openly relishes his involvement in the case, which he calls the Starship Noriega." What follows, are some of Sharpstein's more colorful metaphors and twisted cliches. 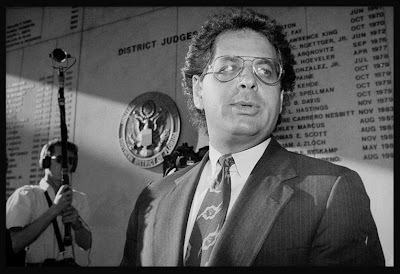 Sharpstein represented embattled Dade County commissioner Joe Gersten in the early 90's. When Gersten was spotted signing autographs at a bar, Sharpstein told the Herald: "He's out on the campaign trail. He's been signing a lot of autographs lately and, like Elvis, he's been spotted in a lot of places." In the mid-80's, Sharpstein represented one of eight Miami cops who were implicated in the beating death of career criminal Leonardo Mercado. At trial, Sharpstein had this to say of Mercado: "Leonardo Mercado was a cockroach who bred a new generation of baby cockroaches." Sharpstein called Mercado's stepsons - whose last names were Soto, and who admitted to selling dope and lying on the stand - "Teenage Mutant Ninja Sotos." In the early 90's, Sharpstein represented one of four executives of home builder GDC, who were accused of conspiring to cheat thousands of home buyers during the 1980's. Prosecutors said the four broke the law when they brought buyers to Florida on trips to see homes -- but the trips, the prosecution said, prevented buyers from learning about the local real estate market. Sharpstein scoffed at the charges. "If you're going to charge these men with a crime, you might as well indict Vanna White for hiding vowels." In the mid-80's Sharpstein represented a top manager with the City of Miami, who along with dozens of others, was accused of buying stolen clothes from Emeterio Marino Pijeira, a man who kept his small Miami duplex filled to the rafters with racks of suits, dresses, ties, belts and shoes. The Herald reported that Pijera "didn't accept credit cards and charged no sales tax." Said Sharpstein of the charges, "It's not the crime of the century. Wasn't it Woody Allen who said that in his family it was a crime to buy retail?" And in 2000, Sharpstein represented a Miami cop accused with three other officers of taking part in the cover-up of the 1997 shooting of a homeless man. Back in 1983 Michael Putney was a relatively young, hot-shot reporter at WTVJ. 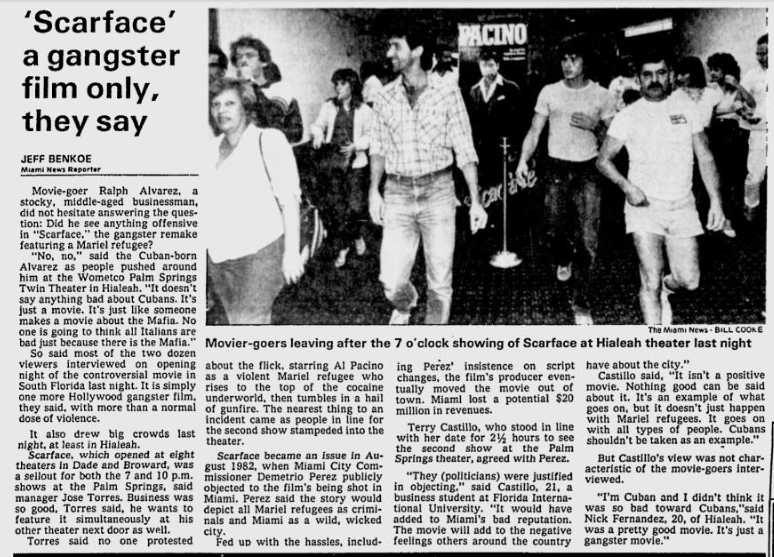 And on the afternoon of Dec. 9, 1983, he was outside the Miracle Theater in Coral Gables interviewing folks who had just paid $4 to see the first screening of Scarface. On Al Pacino's accent: "Dad never taught Tony [Montana] how to talk good. What a mumbler. And what an accent Al Pacino has here. A mongrel mixture of the South Bronx, Milan and Matanzas." On the movie: "You can sum up Scarface in two words...bang bang, snort snort." I wonder if Putney's opinion of the film has changed in 30 years? I'll contact him and ask. Stay tuned. Miami News, Dec. 10, 1983. 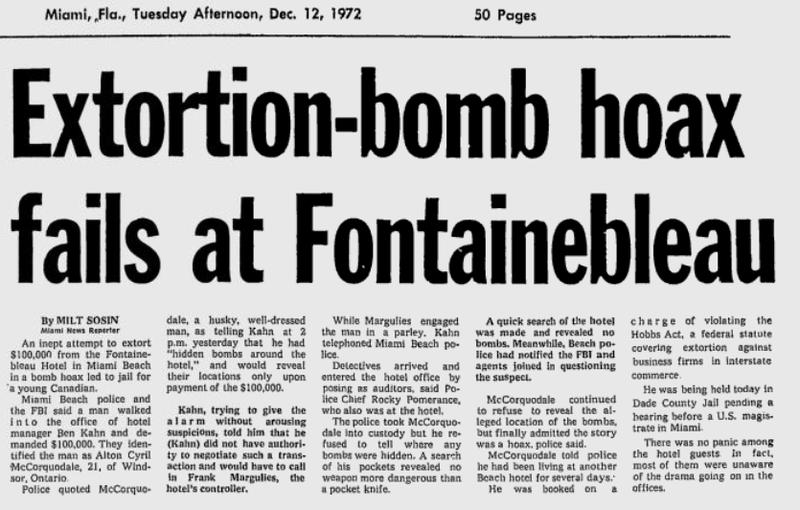 30 years ago this week, on Dec. 9, 1983, Scarface came to town. A loud Bronx cheer somewhere from the front rows greeted the image of Fidel Castro as it flickered on the theater screen. Laughter greeted actor Al Pacino efforts to imitate a heavy Cuban accent as he cursed "the Commoonists." And groans filled the theater as a Colombian drug-runner got a bullet in the brain on a busy Miami Beach street. Such was reaction at the Miracle theater in Coral Gables Friday afternoon as Scarface opened in seven Dade moviehouses. The movie is about a Mariel refugee who spills blood by the gallon to make it to the top of the drug underworld. A number of Cuban exiles in Miami had expressed fears it would tarnish the image of all Cubans and Miami. Judging from theatergoers' comments, though, the fears were, perhaps, exaggerated. William Nitzschke, a carpenter took his wife to the matinee, said, "It was a fantastic movie. They might have overdone the violence a little, but it was a great movie." Nitzschke said the movie's fictional account of a Cuban cocaine czar didn't affect his view of Cuban exiles or Miami. "Al Capone didn't hurt Chicago, did he?" he said. Nitzschke's wife, a registered nurse, said Colombian and Bolivian drug dealers were made to look worse than the Cubans. The movie also left her with a somewhat sympathetic view of the main character, played by Pacino, who kills and maims his way to "success." "He didn't have bad feelings," she said. "It was just the way he made his living." Those coming out of Scarface found themselves beseeched by television cameras and reporters anxious to find out what a South Florida audience thought of the movie that producers pulled out of Miami. The film's producers, who originally planned to shoot most of it in Miami, left for California when the controversy over its treatment of Cuban exiles heated up. They later claimed Miami lost millions of dollars that it would have made during the filming. Theater manager Joe Kram said the Miracle sold more than 360 tickets for the matinee, leaving only a few empty seats. Kram said it was unusual for a film to draw such a large crowd for a matinee during the Christmas season. Scarface , he predicted, will sell out the whole weekend. In a Dec. 4, 1983 review of Scarface, the Herald's movie critic, Bill Cosford wrote: "It's not a great movie, not even a very good one..."
Scarface does contain one scene that seems destined to become a screen classic: crazy Tony behind his big desk in the mansion, burying his nose in a mound of coke and rooting in it like a hog, then lifting his head to reveal a hilarious, white- tipped nose. And all the while, the Bolivian hitmen are swarming over his walls, closing in. The performances are good, Pacino's dialect notwithstanding. Bauer has something of the perfect sidekick about him, and he looks and sounds like a Miami Cuban, which, in fact, he is. Mastrantonio is his female counterpart, and Pfeiffer is the proper ice queen with the frozen nose. The script, by Oliver Stone (who won an Oscar for his adaptation for Midnight Express) is pulpy and quick and fairly campy -- the movie has a tough time keeping up with it, and at just under three hours, it occasionally drags. It's hard to call a film such as Scarface fun, but that's all there is to it. You either like De Palma, and you like your gunplay and blood bags, or you don't. Yes, we expect more from this director, because he knows what he's doing. But this is his genre picture, and the genre is tough, particularly given 50 years of screen liberation. It's a comic strip all right, but a mean one. One of those in the audience for the very first screening of the film at the Miracle that Friday was Rene Rodriguez, then a student at Coral Gables Senior High. He wasn't about to wait until the weekend to see the film. "Scarface had to be seen immediately," he would later write. "I skipped school the Friday SCARFACE came out and caught the first showing at the Miracle Theater (I had to buy a ticket for another movie and sneak in, because they used to be very strict about R-rated films back then). "When I walked out of the theater, Dwight Lauderdale [from Channel 10] stuck a microphone in my face and asked me what I thought. I said something like "It was really good and bloody." They used it on the 6 o'clock news. My first ever movie review! "Monday morning, when I walked into homeroom and handed the teacher my fake note explaining my absence, she said 'Uh-huh. I saw you on the news. Don't even try.' BUSTED." Rodriguez went on to study film at the University of Miami and is now the Miami Herald's movie critic. Twenty years after the release of Scarface, Rodriguez was getting paid to write about film. Today, Scarface is considered to be one of the most influential Hollywood movies of the 1980s, as important to - and loved by - its generation as The Godfather was to their parents. And how has Scarface aged as a piece of pure cinema? Very well, actually. The story arc depicting Tony's meteoric rise and even faster fall is still problematic, and the feeling remains that the movie is too big, too oversized, for the hamfisted tale it tells. But it's that same lurid aura - from De Palma's overheated visuals to Ferdinando Scarfiotti's immense, extravagant sets to Pacino's volcanic, spittle-flecked performance - that makes Scarface so indelible and vibrant even 20 years later, and keeps it from becoming an object of tacky retro nostalgia. The movie also contains the most succinct visualization of 1980s greed and excess of any movie from that decade: an overhead shot of a coked-out Tony Montana sitting in his bathtub in the middle of his gigantic, gold-plated bathroom, smoking a cigar and staring blankly at the TV set, having finally amassed his fortunes and yet still feeling miserable and alone. It may not qualify as high art, but as far as pop culture goes, Scarface is immortal. Random Pixels: 'Scarface'...now the story can be told! You Shall Not Pass, Dog: Dogs terrified of cats. 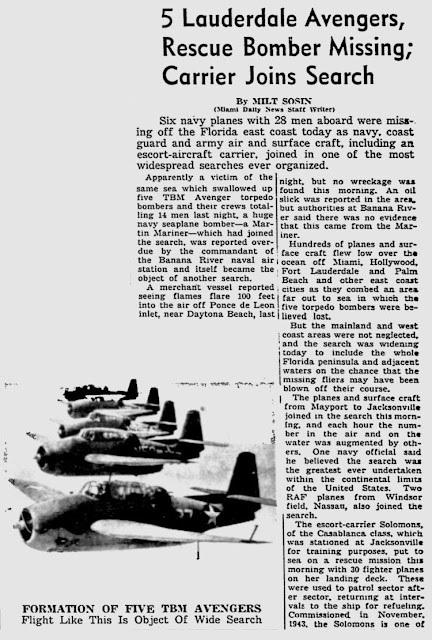 68 years ago today: Flight 19 from NAS Ft. Lauderdale disappears. Miami Daily News, Dec. 6, 1945. 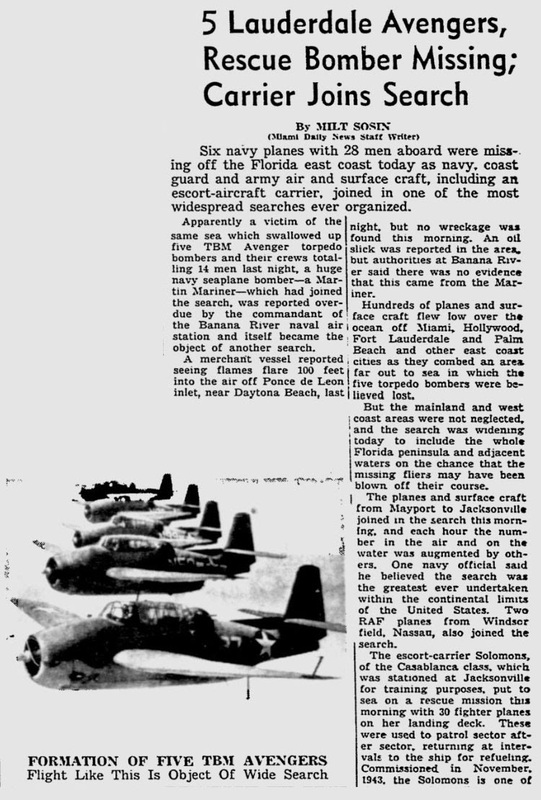 Sun-Sentinel: One of aviation's biggest mysteries endures after 68 years. Mark Soyka tells John Dorschner how News Café came to be a 24-hour operation. John Dorschner retired from the Miami Herald earlier this year after 42 years at the paper. But he didn't stay retired for long. Lately, John's been out breaking news, interviewing people, shooting videos and writing stories for the Biscayne Times and others. He's even started a blog. John has a story in this month's Biscayne Times: A fascinating interview with News Café owner Mark Soyka. Dorschner writes, "Soyka is often hailed as a visionary for opening [News Café] on Ocean Drive well before the crowds came, and then, in 1999, for opening Soyka Restaurant at 55th and Biscayne, a move that many believe sparked the rejuvenation of the Boulevard." Read the full interview here: Soyka at 70, News Café at 25. John's not much for self-promotion...so I'll do it for him. Go on over to Facebook and "like" his page and follow him on Twitter. I have a feeling John's going to be writing about things you won't see anywhere else. 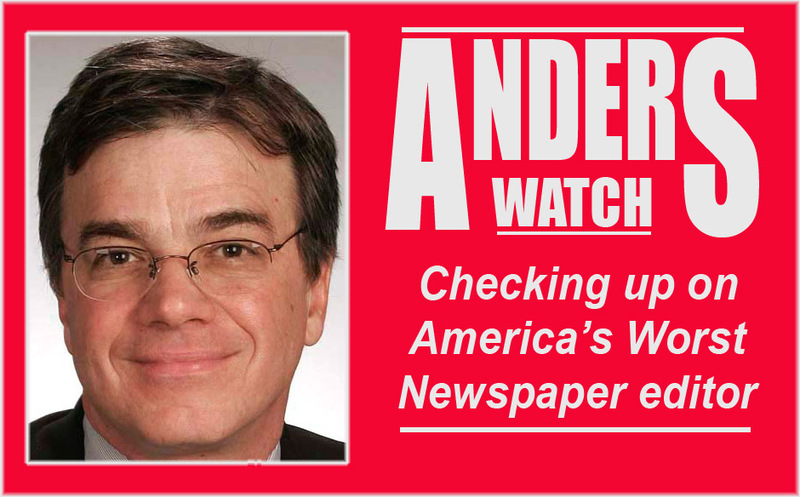 When last we heard from Anders Gyllenhaal in 2010, he was hightailing it out of town, leaving the Miami Herald where he had been the paper's executive editor for roughly three years. 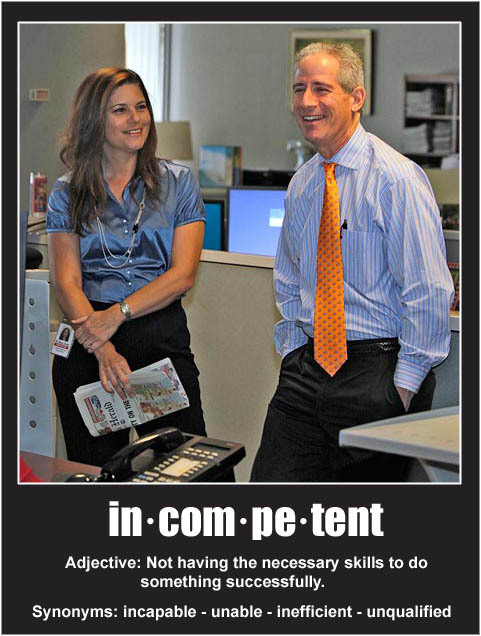 In Oct. of 2010, the Herald's parent company, McClatchy, named Gyllenhaal vice president, news and Washington editor. During his tenure at the Herald, Gyllenhaal oversaw massive staff cuts and one of the steepest circulation declines in Herald history - a decline that continues unabated under his successor. In 2012, Miami New Times reported that Gyllenhaal was pulling down a salary of $375,000. He went home with $56,000 in "incentive compensation" last year on top of his $375,000 salary, according to new filings obtained by Riptide. Along with stock awards and "other compensation," he nearly made $1.3 million last year. So, we were more than a little surprised the other day, when the highly-paid, big-shot editor Anders Gyllenhaal took some time out of his busy schedule to fire off an email to us. While he didn't come right out and say it, Gyllenhaal was apparently annoyed with my latest post that criticized Herald managing editor Rick Hirsch and executive editor Mindy Marques. I received your most recent email and would like to make a couple of points. 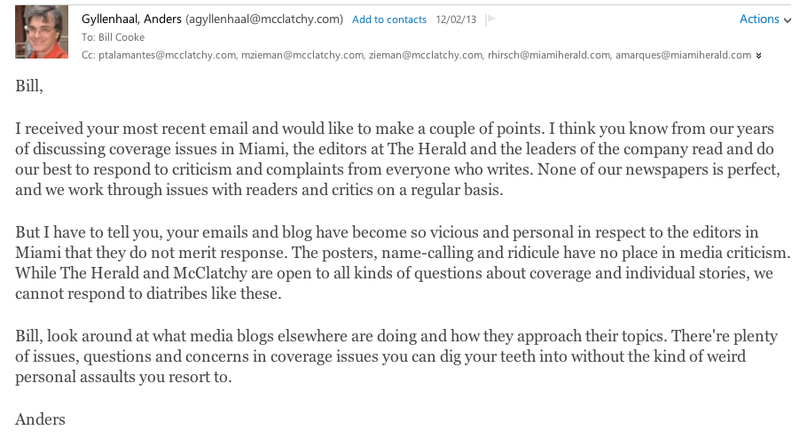 I think you know from our years of discussing coverage issues in Miami, the editors at the Herald and the leaders of the company read and do our best to respond to criticism and complaints from everyone who writes. 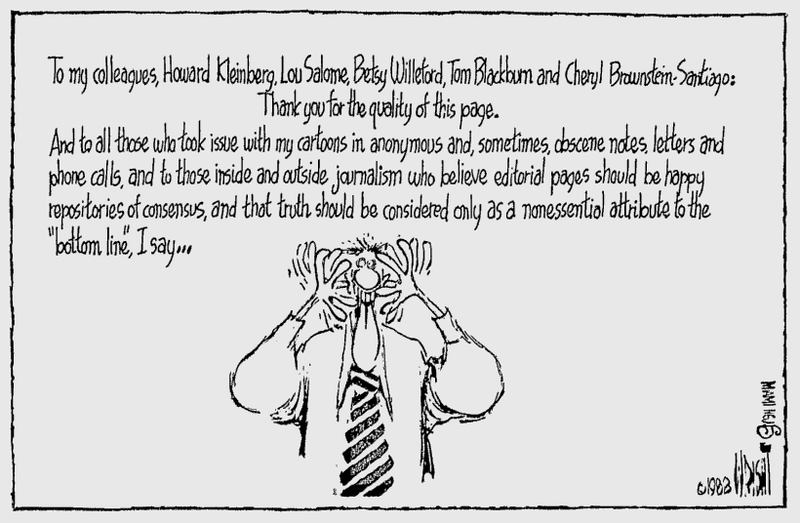 None of our newspapers is perfect, and we work through issues with readers and critics on a regular basis. 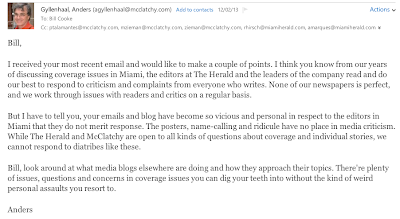 But I have to tell you, your emails and blog have become so vicious and personal in respect to the editors in Miami that they do not merit response. The posters, name-calling and ridicule have no place in media criticism. While the Herald and McClatchy are open to all kinds of questions about coverage and individual stories, we cannot respond to diatribes like these. 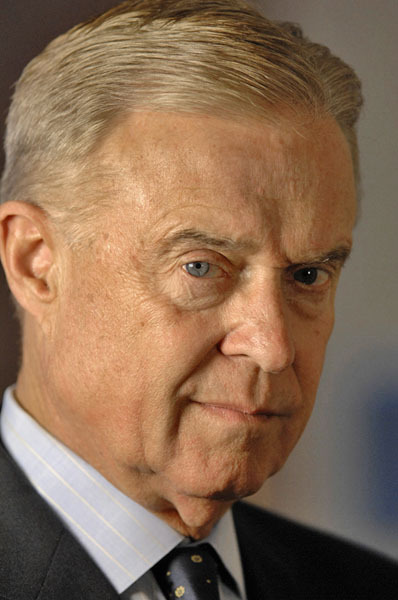 Bill, look around at what media blogs elsewhere are doing and how they approach their topics. There're plenty of issues, questions and concerns in coverage issues you can dig your teeth into without the kind of weird personal assaults you resort to. Gyllenhaal is a prime example of why newspapers, like the Herald, are failing miserably. Gyllenhaal still doesn't realize that this is no longer 1985 and that newspapers no longer control the dialogue. There are two lines in Gyllenhaal's email that prove how out of touch he is...and also prove that he wants it both ways. "The posters, name-calling and ridicule have no place in media criticism," writes Gyllenhaal. Gyllenhaal apparently never got around to reading Herald Star Columnist Fabiola Santiago's attack on filmmaker Billy Corben last year. In her column she called Corben a "tweeting twit." [S]he uses her column for a full-out ad hominen attack on Corben. She makes a point of using his legal name, "William Corben," like she was an angry mother reprimanding her son. 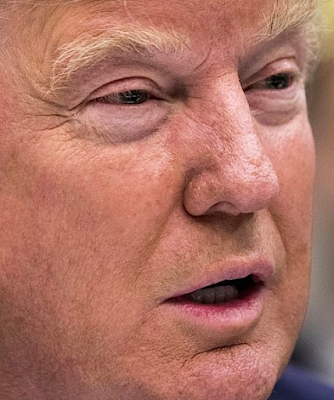 She calls him "condescending," and a "bad-boy" narcissist, and chides his "stupidity" and "runaway self-promotion." Never mind that Santiago herself comes off as condescending and slightly stupid. And I'm pretty sure Gyllenhaal never saw Santiago's column last February where she bullied, ridiculed and name-called a teen girl struggling with dependency issues who happened to get on the wrong side of a hot-headed judge with issues of his own. But my favorite line in Gyllenhaal's email is the one where he advises me to "look around at what media blogs elsewhere are doing and [see] how they approach their topics." Imagine that...Anders Gyllenhaal, an executive for a failing newspaper chain, and the man who single-handedly drove some of the few remaining nails in the Miami Herald's coffin, offering me advice on how to do anything. Thanks, but no thanks, Anders. I think you have your hands full taking care of your own crumbling empire. What do border collies do on their day off? The same thing you do. They screw off. Local 10's Michael Putney closed out his show Sunday morning with some thoughts on the recent reports of Miami Gardens police harassing and arresting the patrons and employees of a convenience store in the Gardens. Before we leave you this morning, my personal perspective on law and order, Miami Gardens-style. it is, in a word, ugly. But don't take my word for it, let's go to the video. It shows Miami Gardens police officers harrassing customers and employees at a convenience store, the 207 Quick Stop. Most of the cops are white, nearly all of the customers are black. Naturally, you're wondering, why are the cops acting this way? Well, the answer apparently is that the owner of this store, Alex Saleh, signed on to the police department's zero-tolerance against law-breaking about two years ago, then watched the cops use that policy to roust, harrass and abuse many of his customers and one of his workers. Saleh withdrew his support for "zero tolerance" and that's when the cops stepped up their harassment. After the Herald broke this story, Local10 and other TV stations ran with it, showing the disturbing video and getting reaction. But the reaction from the Miami Gardens mayor was not what you'd expect. Instead of condemning this obvious police misbehavior, Mayor Oliver Gilbert basically defended it, and criticized the store owner. When more incriminating videos were released, the mayor finally conceded something might be amiss. Then late Wednesday, Miami Gardens city manager, Cameron Benson, weighed in saying he was, "deeply bothered by these allegations" of misconduct. Wow, that's reassuring. Just "deeply bothered" when white cops are manhandling black residents? How about saying you're outraged [or we're] going to put an end to it while we conduct an investigation? Well, the city manager says there will be an investigation and he's asking the state attorney to review it. FDLE, too. A better idea would be to ask the Florida Department of Law Enforcement to conduct the investigation. Otherwise, I smell a whitewash coming. It's been a little over a year since the Miami Herald announced it would start charging readers to access the paper's website. Why are we doing this? The world of news and information keeps changing. Technological advances provide us with the convenience of mobile phones, tablets and social media channels. We have transformed our business to become 24/7 information specialists, with the ability to deliver breaking news through a variety of digital platforms in addition to our print newspapers. These changes have resulted in a new business model, whereby the cost of producing our news coverage is spread across the various channels we provide. The Herald's paywall went up on Dec. 18, 2012. I'm no mathematical genius, but by my calculations, it's been almost a year since the Herald started charging to access the website. So how's that plan to deliver "Breaking News 24/7" working out? Sometime Saturday night, 4 women were shot in Liberty City. Two of the women died from their wounds. The Herald's 24/7 Information Specialists finally got around to posting something on the shooting at 10:57 this morning. And the story? A four sentence copy-and-paste job from CBS4 that fails to mention that two of the women died. You don't need to follow the news all that closely to know that these kinds of violent crimes are occurring all too often in Miami-Dade. Suspect Charged With First-Degree Murder With a Firearm in Miami-Dade Nail Salon Shooting of Aaron Vu. Child Shot in Miami Gardens, in City's 10th Shooting in 11 Days. Boy, 9, Shot in Face While Sleeping in Liberty City Home. Elderly woman shot while sitting inside home. And just yesterday, in a story the Herald hasn't yet copied and pasted from CBS4, a man and two teen boys, carjacked a Miami Gardens man at gun point. Most of those stories received scant, or minimal coverage on the Herald's website, and if they made it into the paper, more often than not, they were buried deep inside the local section. Crime has reached epidemic proportions in Miami-Dade. But you wouldn't know it from reading the Herald. What stories are more important than crime to those in charge at the Herald? 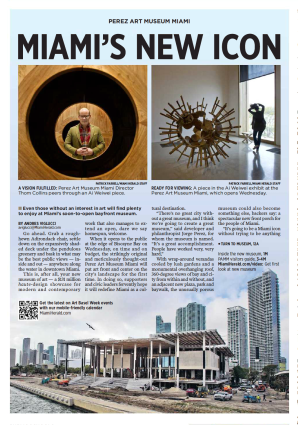 Miami Herald, Dec. 1, 2013. Miami Herald, Nov. 24, 2013. When will the Herald start covering crime the way it should be covered? Probably when it starts affecting the paper's two top managers. As far as Herald managing editor Rick Hirsch is concerned, there is no crime problem. At least not in his neighborhood. He lives in a half-million dollar condominium on Belle Isle in Miami Beach. And the Herald's current executive (absentee) editor - and former People Magazine Miami bureau chief - Mindy Marqués, doesn't even live in Miami-Dade. She lives in Broward County. Today I'm offering Rick Hirsch and Mindy Marqués this challenge: For the next year - starting Jan. 1 - how about covering crime in Miami-Dade as if it were occurring in your cloistered neighborhoods of Belle Isle and Davie? In other words, cover crime as if it were affecting you the same way it affects people in Liberty City, Overtown, Opa-Locka and Miami Gardens every goddamned day of the year. 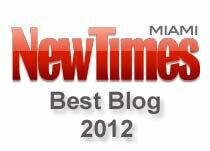 Cover and analyze every violent crime that occurs in Miami-Dade for a year. Explore how violent crime impacts young children. How does it affect them developmentally? Try to explain how high-powered weapons end up in the hands of young thugs. Try to learn why 15 and 20 year-old men seemingly have no moral compasses. Report all that and explain it to your readers. 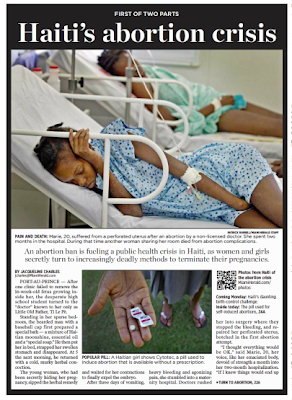 Stop chasing that Pulitzer in Haiti that you'll never win, and start covering things in Miami-Dade that actually impact the lives of your readers. In case you've forgotten, your readers are the people who buy your paper, patronize your advertisers and pay your salaries.